Bengaluru: Hugely upset over reports that Aero India -- Asia's largest military aviation exhibition -- will be moved out of Bengaluru, where it has been held since 1996, Chief Minister HD Kumaraswamy and his ministers have been demanded that the centre speak up on the issue. And on Monday evening it did - kind of. While there was no word from Defence Minister Nirmala Sitharaman, her colleague Ananthkumar, who represents Karnataka's Bengaluru South in parliament, said he had spoken to her and dispelled all speculation as "rumours". Reports had said that Aero India would be shifted from Karnataka, the country's aviation capital, to Lucknow, where the centre is building a huge defence corridor. As friction grew within the BJP over the Aero India controversy, Parliamentary Affairs Minister Ananthkumar tweeted: "There is no decision on shifting #AeroIndia 2019 venue out of Bengaluru to Lucknow, as clarified by Defence Min officials. I have spoken to @nsitharaman ji (Nirmala Sitharaman), who has confirmed the same. There were similar rumours last time too, which were proved to be unfounded (sic)." Karnataka Chief Minister HD Kumaraswamy wrote to Ms Sitharaman earlier in the day insisting that Bengaluru would be the "best choice" for the biennial event. "Bengaluru being the hub for defence and aviation majors of the country, is certainly the most suitable place to conduct the show," he said in the letter. Mr Kumaraswamy also targeted the state BJP leadership. "Our BJP friends in Karnataka have to answer. We requested defence minister when she visited, he said. Following the Chief Minister's challenge, the Karnataka BJP leaders have said they will write to Ms Sitharaman opposing the shifting of the air show. For days, there has been a buzz that Aero India might be held in Lucknow in November-December this year. On Saturday, at a programme to announce a defence corridor in Uttar Pradesh, Chief Minister Yogi Adityanath urged Defence Minister Nirmala Sitharaman to shift the venue of Aero India to his state, saying it would benefit defence production. A huge defence corridor, encompassing Aligarh, Agra, Kanpur, Lucknow, Jhansi and Chitrakoot, is being built in Uttar Pradesh. Aero India has traditionally been held at Yelahanka air base outside Bengaluru. 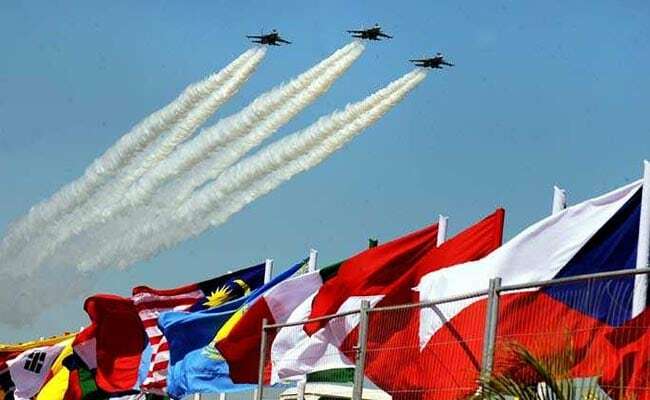 The last Aero India show was held in February last year, in which 549 defence firms and 72 aircraft from 51 countries participated. It was attended by 2 lakh business visitors. In Uttar Pradesh, aviation minister Nand Gopal Gupta said preparations were on. "UP represents good business and good opportunity. That's why Lucknow should get the aero show... Whatever we lack in infrastructure we are trying to add on a war footing," he said. Asked about speculation that Aero India may be shifted, Ms Sitharaman said earlier this month that many states were asking for a fresh venue, reported Deccan Herald. She also cited the case of Defence Expo, which was initially held in Delhi then shifted to Goa and later to Chennai, the daily reported. On Saturday, Karnataka revenue minister R V Deshpande also met Home Minister Rajnath Singh in Delhi to discuss the issue. Earlier, Karnataka Pradesh Congress Committee chief Dinesh Gundu Rao had also written to the defence minister on the subject. Accusing Ms Sitharaman, a lawmaker from Karnataka, of betraying the state, Mr Kumaraswamy's predecessor Siddaramaiah tweeted yesterday to say that the reports of shifting Aero India "will deepen the wound caused by the recent exit of many defence projects under @BJP4India. The exit of #Rafael project from HAL is still in the memory of people of Ktaka."